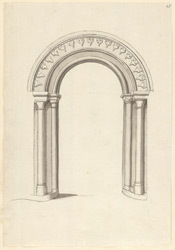 An elevation in ink of the gateway of St Mary's in Arden church, in Harborough, Leicestershire. It was built in the 12th century and known as the Chapel of Great Bowden. In the 13th century, a subsidiary chapel-of-ease was created to serve the needs of the new settlement of Market Harborough. This chapel was extended over time and is now known as St Dionysius church. St Mary's was declared redundant in 1974 and has since been under the care of Harborough District Council. It was declared an ancient monument in 1978.